TSINGTAOHAIR PRODUCTS CO., LTD., as a large hair products manufacturer in China, Our Main products include: full lace wigs, lace front wigs, glueless lace wigs, virgin hair lace wigs, silky top ( hidden knots) lace wigs, lace frontals & closures, hair wefts & extensions etc. We provide highest quality and service, our units are made from 100% Indian Remy, Chinese Remy, Indian Virgin, Chinese Virgin, Brazilian Virgin, Malaysian Virgin and Mongolian Virgin Human Hair in the wig industry. We stand behind products and can truly say we are amongst the best! Our products will practically sell themselves well and your potential for success is high, because your venue is broad, being able to market these units to your current clientele and their referrals. This is the perfect time to tap into this increasingly growing business with Tsingtaohair! Please contact us for wholesale if you are interested in wholesale purchases. Below are stock lists and please click to down load! Over 15 years experience in hair industry with advanced hair production technologies, skilled staff and strict Quality Control inspection systems. We stand behind products and can truly say we are amongst the best! As a world-leading manufacturer of lace wigs, we supply best quality lace wigs at lowest prices. Our customers are mainly wholesalers. You success is our success! 3. Personalized customer service and after safe service. Make you satisfied always! 4. Different pricing products satisfy different markets. We have best quality lace wigs, high quality lace wigs, cheap lace wigs, lace front wigs and all machine made human hair wigs with difference prices to satisfy different markets. No matter what wigs your customers would like, we have them! 5. Over 5000 lace wigs in stock for immediate delivery. 6. All the money you make is yours to keep. This is a great business opportunity to some extra revenue flowing into your business, by selling Tsingtaohair.com Full Lace and Lace Front Wigs. Our program is like no others, No licensing requirements, No reseller fees, No minimum purchase requirements and best of all, all the money you make is yours to keep. We are just the factory offering you best quality and lowest prices, the rest is up to you, we have nothing to do with how much money you make, which can be very plentiful. Our top grade quality lace wigs will practically sell themselves and your potential for success is high, because your venue is broad, being able to market these units to your current clientele and their referrals. This is the perfect time to tap into this increasingly growing business! 8. 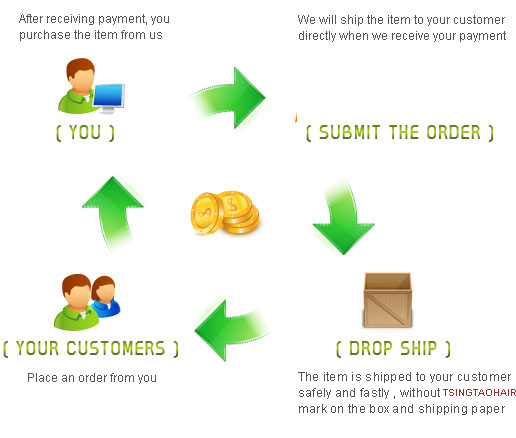 Over 10 years experience on drop shipping service. It equals to you build your own wig manufacturer without cost. The customers from US, UK, Canada and Asian countries can receive wigs in 2-3 work days after shipping! The customers from France, Belgium, European, Africa and other countries and areas can receive wig in 3-5 work days after shipping. 10. Share photos and stock lists with customers! Once you become our wholesale customers, we will share our products' photos and stock list with you to help you expend your business.